You are all invited to join the Malden Filipino Choir to the La Salette Shrine's Festival of Lights. We are going on Dec 28, Wednesday, at 7 pm. We will meet at the Church and see the sights from there. Dress in layers and keep warm. Don't forget those gloves, caps, and scarves. Bring your thermos with hot beverages. God bless and have a Merry Blessed Christmas and a Happy New Year. 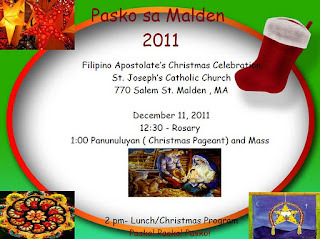 PASKO SA MALDEN 2011. Hope you will join us and bring your family and friends. When: This Sunday, Dec. 11, 12:30 - 4 pm. 1:00 pm: Christmas Pageant and Mass. Potluck lunch follows. Our traditional Malden Christmas Pageant is now on its 7th year. It will be in Tagalog (Panunuluyan) and will feature our youth, young adults and the young at heart. The Pageant tells of the humble birth of Jesus Christ, our Savior, Messiah and King. Holy Mass will follow the Pageant. Potluck lunch will be served after at the church hall. Our Christmas Program will include dances and songs. Santa Claus will drop by and say hello to our children. We ask families with children to bring a small wrapped gift labelled with their child's name and please give them to one of Santa's Helpers. We hope you will join our festivities this Sunday! Maligayang Pasko Po Sa Inyong Lahat!